By which I mean that it’s a bit befuddling sitting here 90 days in, realizing that we’re halfway through our six-month tourist visas for Mexico. We’ve doggedly been focusing on enjoying the moment for what it is and really just concentrating on one day at a time, so to look back and summarize three months here feels about as daunting as eating that proverbial elephant. After one month in Mexico, all I felt qualified to say was that the country had some really nice sunsets and that we had discovered our personal limit on what constituted “too many tacos”. After three months, you may be wondering whether we’ve had any changes of heart or gleaned any deeper insights. Well, yes and no; some of my initial impressions are definitely still true, but some have certainly shifted. On the one hand, the sunsets have continued to impress, even away from the Pacific coast. On the other hand, we (happily) found moving away from a small beach town did wonders for our diet and our enthusiasm for the local food too. 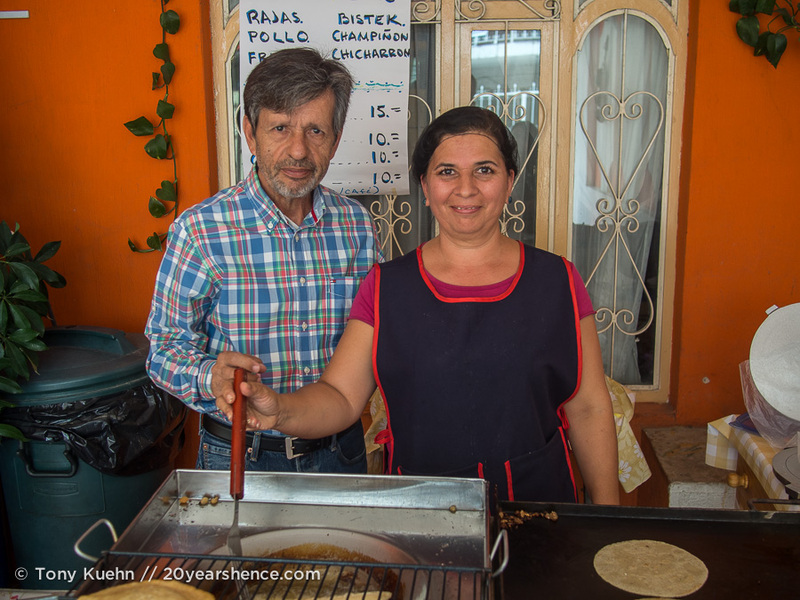 Spending a month in Tlaquepaque was really wonderful as the food was cheap and generally quite varied and although we still ate more than our daily recommend dosage of tacos we were able to mix things up a bit more, which definitely helped. Also, maybe corn tortillas are something you just have to OD on in order to eventually come around on and begin to appreciate. We’re in Morelia now where tacos are weirdly difficult to find (tortas are much more popular and there isn’t much of a street food scene at all), and if we go a couple of days without eating a corn tortilla we feel oddly empty and bereft. On the plus side, we are currently living two blocks from a vegetarian lunch buffet that we hit up a few times a week, so we no longer feel like we’re at risk for vitamin deficiencies or early coronary disease. Did we mention that they like Tortas in Morelia? Did we also mention that this is a Torta with a chile relleno inside? I think I just teared up a little. We continue to find Mexican people extremely kind and welcoming, and our feelings about this have only deepened following our month of Spanish classes as we are now in a better position to actually talk with the people we meet. As exhausting and demanding as our Spanish classes were, being able to hold up our end of an hour-long conversation with our neighbors in Tlaquepaque or the friendly lady who owns an ice cream shop here in Morelia has definitely proven their worth. We still don’t understand everything that is said (especially if we’re not really concentrating), but less and less do we feel like people are speaking especially fast (though they do still speak fast!). We still have a lot to learn and can always stand to practice more as we still bungle up our replies and have to effortfully conjugate verbs in anything but the present tense, however everyone is patient and encouraging, whether it’s the lady at the market we buy our cactus salsa from or people in the park who come over to meet the dogs. Speaking of the dogs, it seems like the three month mark has also been the turning point for them too. 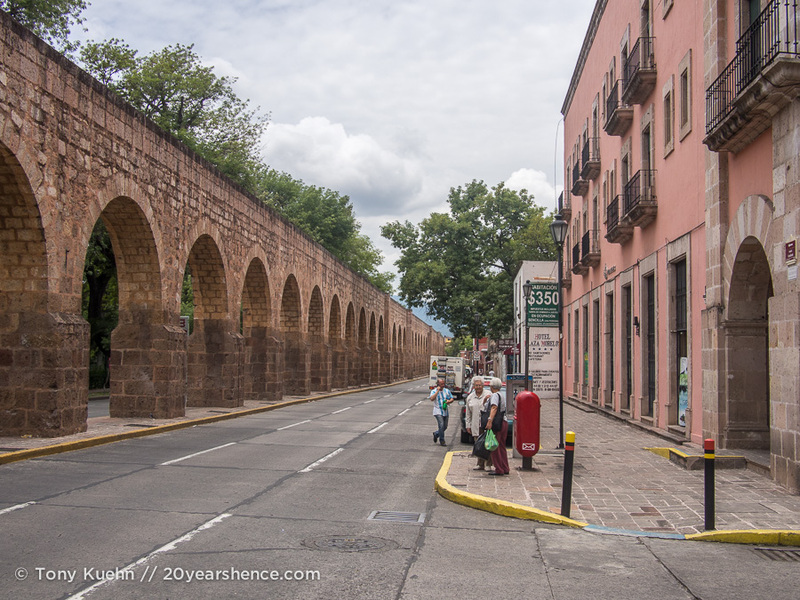 About halfway through our stay in Tlaquepaque, they seemed to relax and really adjust to their new reality and their confidence and comfort has only increased as we’ve moved to Morelia. I’m sure the wide sidewalks and big park nearby and cooler climes here (as well as the lack of aggressive offleash dogs) have helped as their walks here are the least stressful of any place we’ve been and they’re back to getting plenty of exercise, but I think they’ve also just gotten used to the rhythm of their new reality. 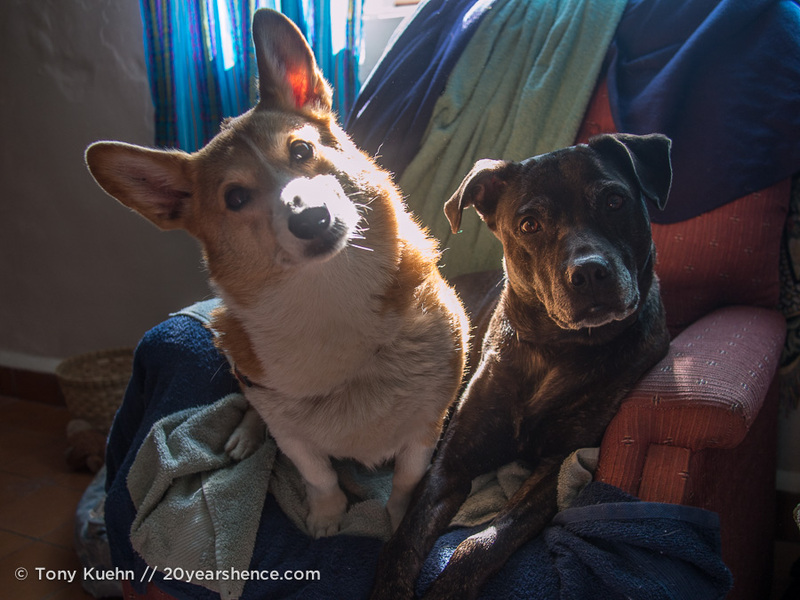 They get excited on travel days as they always have, but now they seem to settle into their new surroundings within a day rather than maintaining high vigilance for a week or so… pretty much wherever their toys and beds are automatically becomes home. Rory’s health issues have also been addressed and although he turned 10 while we were in Tlaquepaque, he is back to barreling around with tons of energy and being feisty as all get out, so that has been a huge relief too. It’s taken us all about three months to really get comfortable out on the road, and although this time in Mexico doesn’t really feel like traveling in the way our previous trip did, when I look back at previous posts, I find the timeline to adjust was about the same then as it is now. We are not darting about manically, trying to take in the country in one desperate gulp, and most of our time is spent working or hanging out with the pups, really just living our lives in a familiar way in an unfamiliar place. Sometimes I feel guilty that maybe we’re not making the most of our circumstance, that every weekend should be filled with epic day trips and ambitious explorations where we shed light onto some hitherto unknown but fascinating facet of Mexican culture, but I also know we have to trust ourselves to do what feels right and allow this trip to evolve as we need it to. Right now, one of the greatest gifts we have been given is the freedom to shape and live our lives exactly as we want, and if that means watching a telenovela (to “practice our Spanish”, obviously…) or tucking into a novel rather than working our way through a guide book’s “must see” lists, then so be it. A game we always used to play during our Big Trip was “Could we ever live here for real?” Pretty much the highest praise we could give a place was that we could, in fact, see ourselves living there some day and hoped we would have the chance to come back and do so. We’re now more actively and purposefully playing that game here in Mexico, trying to find somewhere that we believe would make a good base for us for as long as we have our furry ball-and-chains that keep us tethered to this contiguous stretch of land. 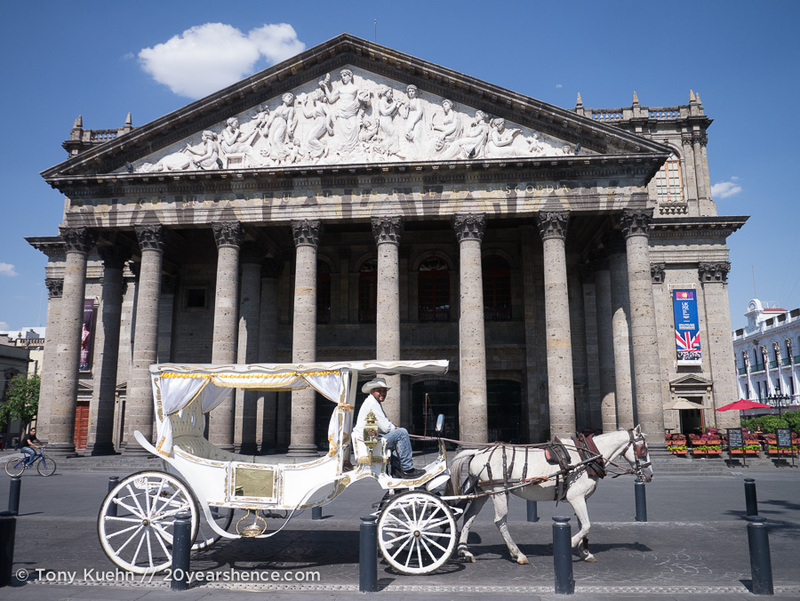 So far, I don’t think we have found our perfect home base in Mexico (if we had to pick right now, then Tlaquepaque/Guadalajara would probably be our top choice), but it’s still early days and there is still so much more of Mexico to explore. Thankfully three months in, we now have the perspective to see just how bad a fit our first stop in Mexico really was for us; we probably would have a better time in La Peñita now than we did then, but… it’s just so clear to us now that it wouldn’t ever be a love match for us. 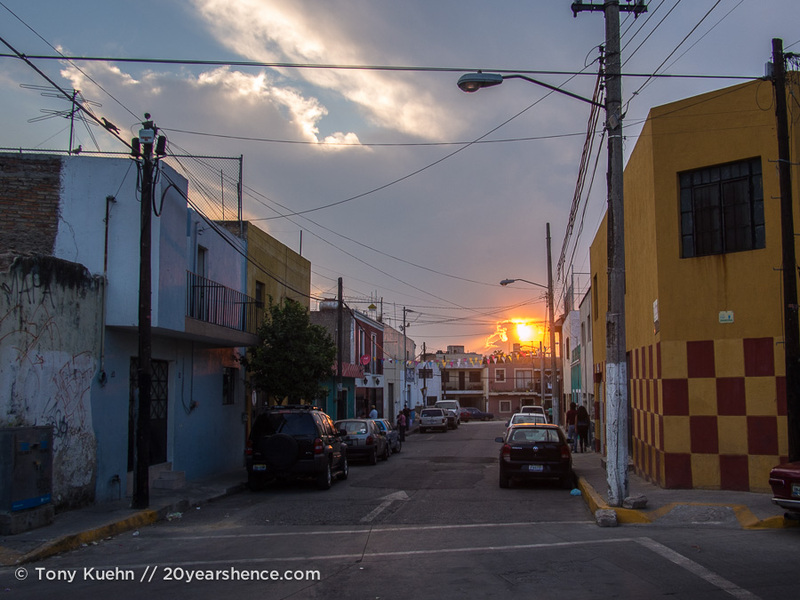 We were worried that Mexican cities might be too gritty or grim, but they’ve actually been beautiful and charming and even if they keep to Mexican time, they feel much more our speed. We couldn’t have known this, of course, when we started out, but the last three months have been all about learning and adapting. 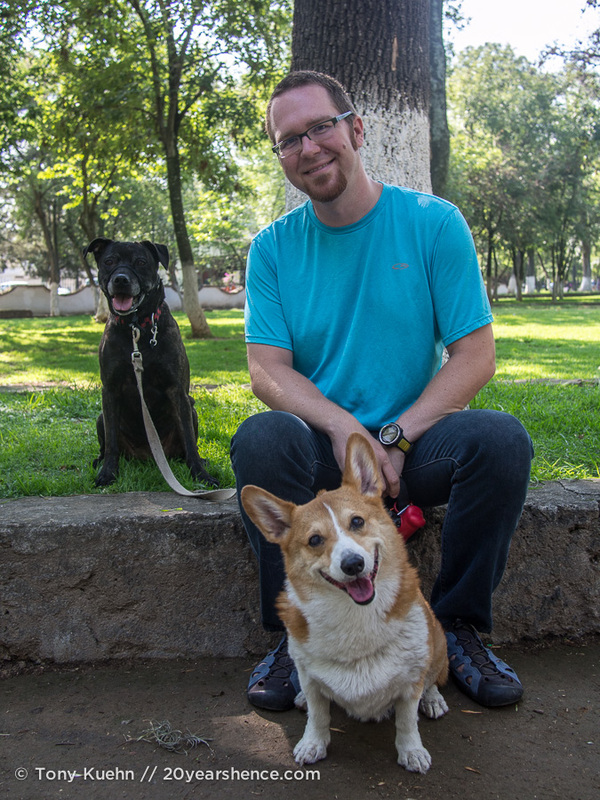 In a similar vein, looking back at that stressful first month, I am increasingly grateful that deciding to travel with the dogs meant tackling Mexico by car as the ability to move around and try on different bases has been invaluable. Not only are we gaining a deeper appreciation for how HUGE and diverse Mexico is, but simply having the freedom to explore at our own pace on our own schedule has been fantastic. I am so glad that we didn’t feel pressured into picking a destination sight unseen and committing to it for six months only to feel trapped. I think it would have been unrealistic for us to expect that we’d nail Mexico on our first try—we needed time to figure out what didn’t work for us in our new surroundings as much as we needed to figure out what might lead to happiness. Moreover, a place that works for a one- or two-week vacation won’t necessarily cut it for a long-term base. Having the car means we can go where we want, explore it to our hearts’ content while we’re there, and then leave when we’re ready. I know plenty of travelers have made it through Mexico relying on public transport and flights but, expensive tolls excepted, I can’t think of a better way to tour Mexico (Tony would say motorbike, but the dogs and I are standing firm on this one for now!). As our confidence and familiarity with the language and how to carry out the basic tasks of daily life have increased, so too has our happiness and appreciation for Mexico. I think at first we were jarred by how Mexico wasn’t like Canada or the U.S., but it also wasn’t really like Asia (somewhere we still miss so much), and it just took us time to unclench and open ourselves up and let it work its magic. There are definitely still some things that drive us batty here, and they change from one place to the next, but I think that would be true for any place we spent an extended period of time. There are always drawbacks and annoyances, the key is finding somewhere where the good bits make up for the rest. 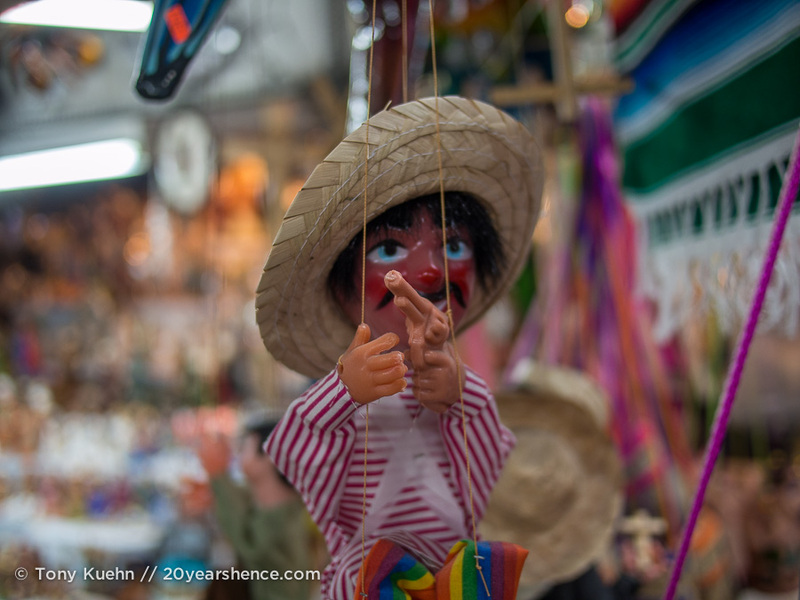 I remember feeling like I had turned a corner while we were in Tlaquepaque; I suddenly felt deep inside me that we had the potential to be very happy here in Mexico (and perhaps Latin America beyond!) and that life could be very good indeed. Three months in Mexico empirically seems like a lot of time has passed, but truthfully, I feel like we’re just getting started and still have so much to learn. Mexico is huge and every place we’ve been has had its own vibe, its own food scene, its own culture, its own rhythm… we’ve really just started to scratch the surface of all that Mexico has to offer. Though we have started to think ahead to visa runs and the next few places we’d like to visit, we know six months exploring here won’t be enough and can’t even fathom moving on to a new country. Right now it feels like Mexico is one big tasting menu and we’ve only now finished up the amuse bouche portion of the meal, the little surprises the chef sends out to warm up your palate and get you ready for the real meal. Also, I know that content on our actual adventures (such as they are) here in Mexico have been a bit thin on the ground, but now that I’ve finally finished telling you about our U.S. road trip, I can catch up on the fun we had in Tlaquepaque/Guadalajara and environs as well as here in Morelia and beyond. At some point, I will also start going through our backlog of European (minimal) and Asian (substantial) adventures too! Time will tell whether we actually do find a place that feels like home to us here in Mexico—after all, three months is both a good chunk of time and also not very much time at all! 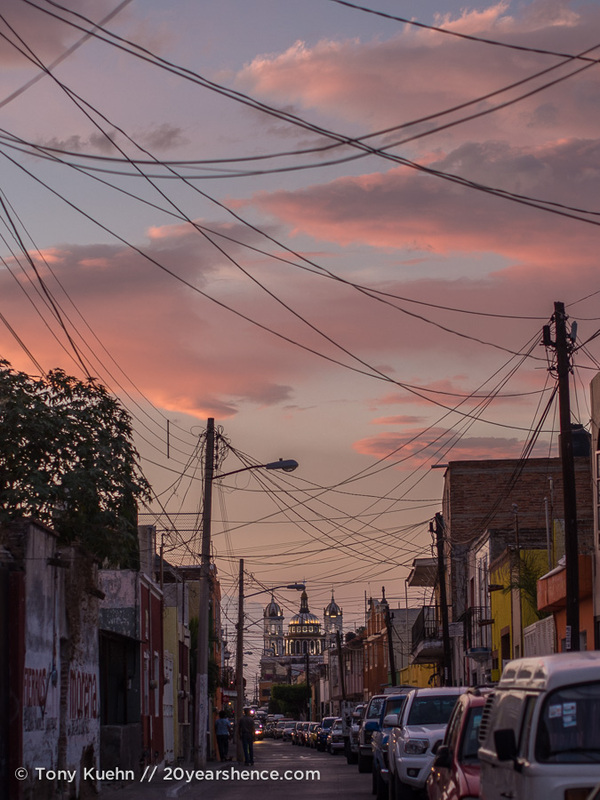 Perhaps after all is said and done we will return to Guadalajara, or perhaps our dream destination still awaits… What I do know is that three months in, we are much closer to finding home in Mexico than we ever have been. We’ll know it when we get there, but until we do, we’re happy to be at the point in our adventure where we can enjoy the journey in its own right. I think we are starting to become corn tortilla experts like how we started to become rice experts in Asia, because we can definitely tell when we are served “good” tortillas vs “bad” ones… and blue corn tortillas are somehow always the most delicious! But all corn tortillas have a short shelf life, so although I think we used to be able to buy them in Nashville, I don’t think they ever lasted very long. Here it’s nice that we can just pick up a bunch of freshly made ones for less than $1 whenever we want. I am so glad that we’re really getting into our groove here in Mexico and that we’re getting a better sense of what kind of place might work for us. There is still so much exploring for us to do—we definitely want to check out San Cristobal de las Casas and we would love to spend some time in Mexico City at some point (if only it weren’t so expensive!). I haven’t even heard of San Agustinillo, but I think we’ve agreed that small beach towns aren’t really our happy place (though they do certainly make for fun vacations!). The longer we’re here in Mexico, the more comfortable and content we become so I’m confident that we’ll eventually stumble upon somewhere that feels like home! 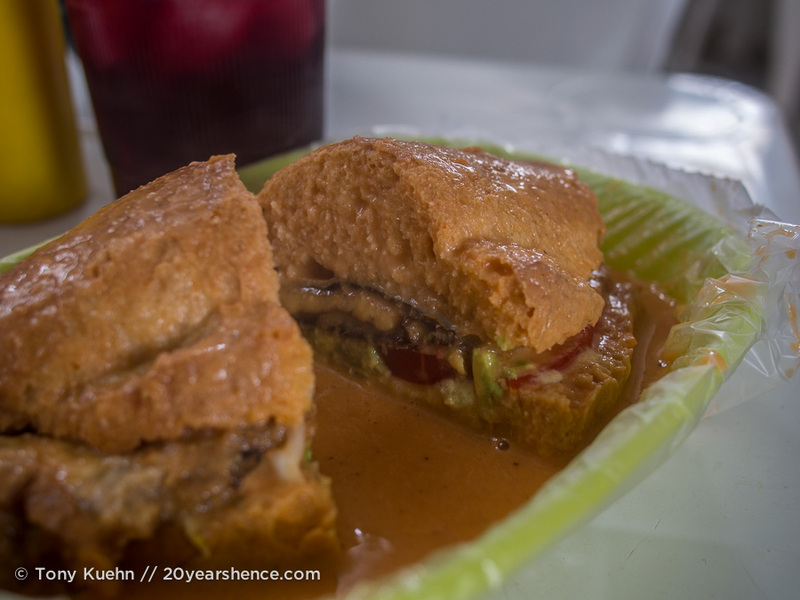 I literally gasped when I read the caption about the chile relleno torta. And when I read about the corn tortillas and cactus salsa I almost cried. I’ll be back in San Diego in three weeks and I am going to go Mexican food crazy! Anyway…it’s wonderful to hear you two are starting to feel a little more at home. There’s just something about month three when living abroad. I feel like I was so lost and overwhelmed during my first few months in Jakarta. But in month three I found a job and started really getting my bearings. I suppose it just takes time to really adjust to new places. But look how far you’ve come. You even feel empty going without corn tortillas! Your pups looks as happy as ever too. They’re so cute! I guess three is the magic number when it comes to adjusting to big life changes and being in an unfamiliar environment. I definitely felt overwhelmed and stressed out our first month in Mexico (who has ever said that about visiting Mexico?!? ), but now that some of the “basics” of daily life have become more commonplace for us, things have definitely gotten easier. We’re more confident in our ability to communicate and we’re more optimistic that we will only become more comfortable with the country the longer we’re here… as far as love stories go, I’m sure ours is still in its infancy, and I’m very excited to see how our relationship with this country evolves in the months to come. I have no doubt that someone who visited any of the places we have been based in Mexico would see more on a week-long holiday than we have in our month-long stints, but we are living our lives and doing what feels right and if we miss out on a few “must see” attractions, then so be it. We have our priorities of what we want to see or experience and make sure to make time for those things, but yes, after two years of traveling full-time, it feels good to be focusing on the parts of our lives that don’t revolve around travel. I saw your post wishing Basil a happy decade of life with your family! 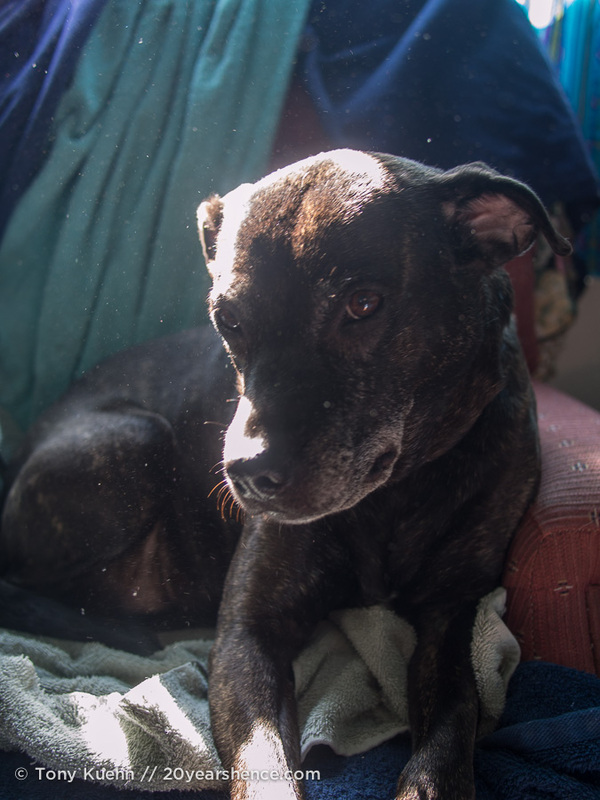 What an adventure he has had—I think it’s pretty great that our dogs have now made it to three countries, but Basil has made it all the way across an ocean! What a great account of your first three months – and it’s so true, it’s both an eternity in travel time (how many people travel for three months continuously, and just in one country to boot?) and nothing at all when it comes to living somewhere. We’ve called DC home for 9 years give or take the time we took off to travel long term, but I still find that I learn not only of new landmarks and neat places here, but culturally I learn and appreciate new things about DC to this day. Which, I think, really goes to the heart of the point you were making that it’s not about what anyone else thinks is the right way to travel or exist somewhere, but really taking the approach you need at this point in time in order to appreciate where you are to its fullest 🙂 Can’t wait to read more about Mexico – we have a dear friend who calls this country her favorite one in the world, and she is from Argentina!! I think our goal is definitely to base ourselves in a place where we could be there for years and still feel that there was more for us to discover. I’m sure on some level this is true of any place, but I think this is part of why we love big cities—because it feels like there is always more to explore and learn and appreciate. Right now it definitely feels like Mexico is that kind of country as it definitely feels like we have to learn new rules and rhythms with each new city we visit. I’m glad that we’ve begun to get a handle on some of the overarching aspects of the culture, but this really is such a diverse place that we could probably spend the next 4 years hopping from a new city every month and still have more to uncover! I’m not a huge fan of Mexican food — I like it, but I can kind of take it or leave it, but maybe that’s just me being Asian and growing up in a very white town with no Mexican food — so I can see how one could easily OD on it! On a related note, I am allll about the tofu clutching. Just this week in fact I’ve been on a tofu kick and have been eating in daily, straight, no toppings or meat or anything. So tasty. And I love broccoli too (my parents raised me on a lot of vegetables!) and your story of that guy throwing out the rest of his plate nearly made me clutch my heart and go Oh gracious! What an adventure! I live been living in Guatemala for a while and have to agree on the tortilla issue you mentioned. We’d love to visit Guatemala at some point—there was a Guatemalan restaurant in Nashville that we really enjoyed when we lived there—and I guess we can look forward to the comfort of corn tortillas there too. It is SO different to live & work somewhere vs. just traveling there. I thought that because we traveled really slowly before and because we are now self-employed that the difference wouldn’t be so jarring, but no, it’s still a huge adjustment. Our priorities definitely feel different from our first trip as we no longer focus solely on just having fun and enjoying ourselves but on building our business and looking after the dogs and developing a reliable friend base wherever we are too. I know finding the right balance will take time just as it will to find the right place for us to spend more than a month. I’m glad we’ve been able to be patient with ourselves and have the confidence to do what feels right for us, even if it’s different from what we did previously. So glad to hear you’ve all finally settled into a routine that is working for you. It is a huge, and diverse, country with an amazing culture. And I’m glad to hear those Spanish lessons are paying off! It sounds like the dogs have settled in (love that picture of them on the chair together 🙂 ) and life is good. I can’t wait to start reading the stories of your time there so far. We still have rough moments here and there, but who doesn’t? Ever since we have moved inland and focused on exploring the cities of Mexico, we’ve really been finding ourselves growing attached to places and I am sure that in another three months when we’ve been here for half a year, we’ll be incredibly attached. We’re still searching for our perfect place, but the hunt feels so much easier and much more likely to result in a “happily ever after” now than it did at the start. The dogs are really settling in beautifully, and it’s so fantastic that vet care here is so affordable. All in all, life is very good! I was not able to reach Mexico in my travel, I honestly don’t include it on my list, it’s not because I don’t like the place but I never find any article about it. When I read your comments, maybe a little bit interest you have putted in my heart. Thanks for taking the time comment, Shara, and I’m glad that our posts on Mexico are providing you with new destinations to potentially explore in the future. It’s a beautiful country & we look forward to sharing many more stories! Even as a proud carnivore, I would find the lack of fresh produce in restaurants disturbing. Though I suspect that you are right that the locals are eating much more green at home. Even in Japan, where the restaurant food is delightful, it in no way reflects what the Japanese people are actually eating at home. (I stayed with a family for a week.) And even here in Latvia, locals rarely dine out and save restaurants for special occasions. You should try to find a Mexican cookbook to see what kinds of dishes they are making at home. I’m curious! I am hoping that when we’re in Oaxaca (soon!) that I can take a cooking class or two. And our landlady here in Morelia has been really sweet and invited us over for brunch last weekend, so slowly but surely we’re getting a sense of what the locals really do eat. Many of the restaurants and food stands we visit are really cheap so I think it is not uncommon for at least some Mexicans to eat out most meals, but yeah, I definitely think (hope?) that people must be eating their healthy meals at home! “living our lives in a familiar way in an unfamiliar place”… this is so beautiful put, and I feel it is my motivator for how I travel more and more. I used to plunge right into the strange and different and bizarre, but I now, I choose to visit friends and lean to the more comfortable side of travel when I go somewhere new and unfamiliar. I think there is infinite value in this, and good for you for embracing it, be it with a book or a telenovela! Re: fried food – we were warned when we arrived in Mexico that we would likely gain 10-15 pounds due to the fried food. I was a bit dismayed by this because I didn’t want to go home heavier just for having lived in Mexico on exchange. As such, I was very careful, but I was also sick the majority of my time there, so believe it or not, I came home skinnier than when I left! Also, I totally bought one of those little puppets with the gun, and he’s hanging in my bedroom in Winnipeg, haha! Maybe if I ever have a kid, it could go into a travel-themed nursery. Also, your dogs! These pics. Just so cute. I’m so happy this trip is working out for you guys with pups and that they are adjusting. Happy days! AND. I’ve wondered this for a while. Not sure if you’ve addressed this in a post or not (trying to catch up.. hehe)… how has it been safety-wise driving in a car? I heard when I was in Latin America that you are targeted if you have a foreign license plate… target for kidnapping etc. That is kind of terrifying. Obviously you haven’t been kidnapped, but what has your research/experience shown you? I’m sure if we were traveling on a more conventional/traditional schedule, we’d be more gung ho about running ourselves ragged and doing all the touristy things, but we’ve definitely decided to embrace the quieter/more local side to things that being somewhere for longer allows. Sometimes our biggest adventure in a day is a trip to the market to get provisions—essentially, we’ve gone grocery shopping, but it’s not the same as popping into a Loblaws and so it really is an adventure! And really, every day can’t be filled with huge adventures—it would just be too tiring!—so I am embracing those days where I just want to get lost in a novel or catch up on tv. There’s definitely a lot of fried food in Mexico, no doubt about it, but I would say that really the thing we struggle with most these days is still the imbalance of meat to veg. Most street food is heavy on dairy and meat, and we don’t really get veggies unless we cook at home. I’m actually suffering from tummy troubles at the moment, so I haven’t had much of an appetite lately so I won’t be surprised if I actually lose weight too… but Mexico is definitely enforcing to me the importance of eating a healthy, well-balanced diet! 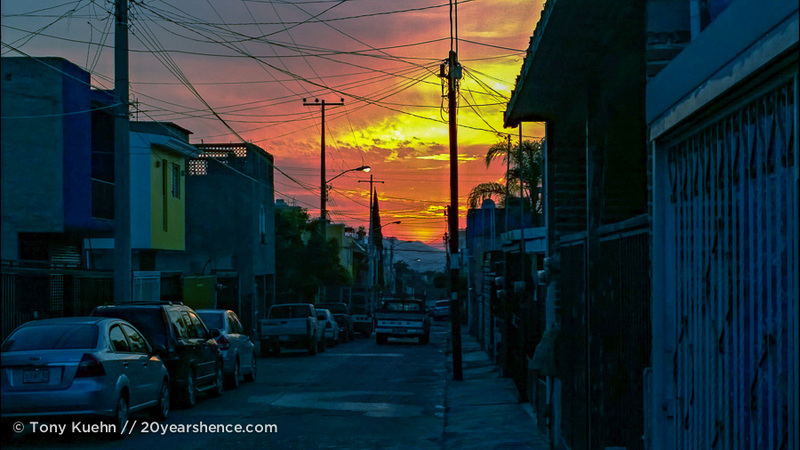 I think I’ll need to write a post addressing Mexico stereotypes and the reality, because we had so many worries and fears based on things we had read in advance and, as tends to be the case, the reality has generally been quite different. We were told that driving in Mexico would be a complete nightmare, but we’ve found the roads to generally be in good condition, drivers to be bad—but not unbearably so, and thus far haven’t experienced any safety issues while on the road. We’ve heard that foreign-plated vehicles are targeted by police for things like bribes, but maybe it’s because we’re in a pretty nondescript car, but so far we’ve been universally ignored. When driving large distances between cities and the like we tend to stick to the toll roads whenever possible, which are pricey, but probably help matters significantly as they are in good condition, traffic is light, and I doubt banditos hang out on them since they are monitored!